UNISON Kinneil Band are holding two Spectacular Christmas Concerts this December. 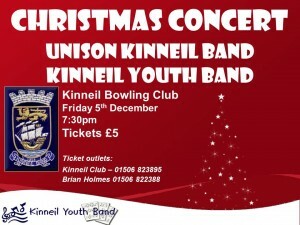 The first is the bands Annual Concert being held the Kinneil Bowling Club on Friday 5th December. The festive evening of entertainment will begin at 7:30pm and will feature our award winning Youth Band. 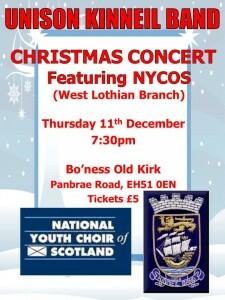 The second Christmas concert will be featuring the magnificant National Youth Choir of Scotland (West Lothian Branch). 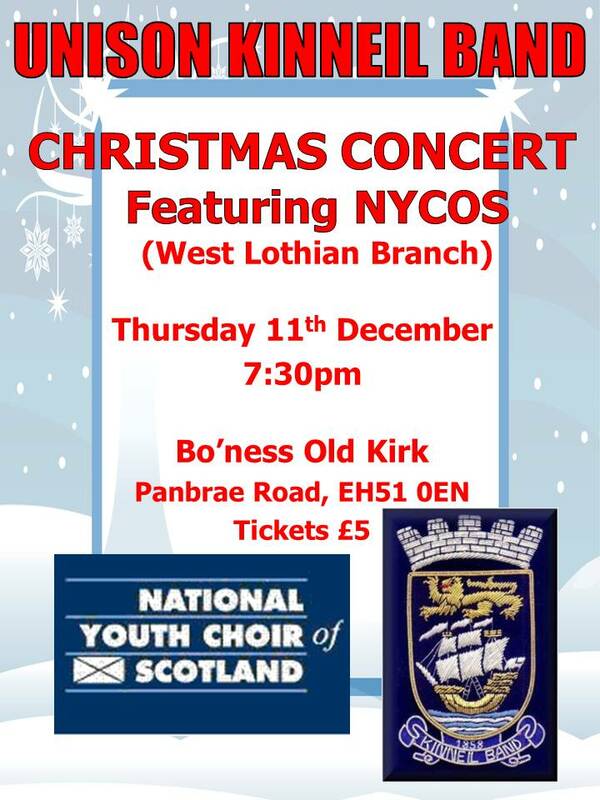 This concert is being held in Bo’ness Old Kirk on Thursday 11th December at 7:30pm. Tickets priced at £5 are ON SALE NOW for both events – we advise you to get your tickets as soon as possible as these are selling fast! Contact Brian Holmes (01506 822388) or Ruth Kelly (01506 828721) to secure your tickets! Tickets are now available for the UNISON Kinneil Band Annual Concert which is being held in Bo’ness Town Hall on Friday 30th May at 7:30pm. The band welcome the Bo’ness born World Famous cornet soloist Phillip McCann to share the stage for a fabulous evening of entertainment. 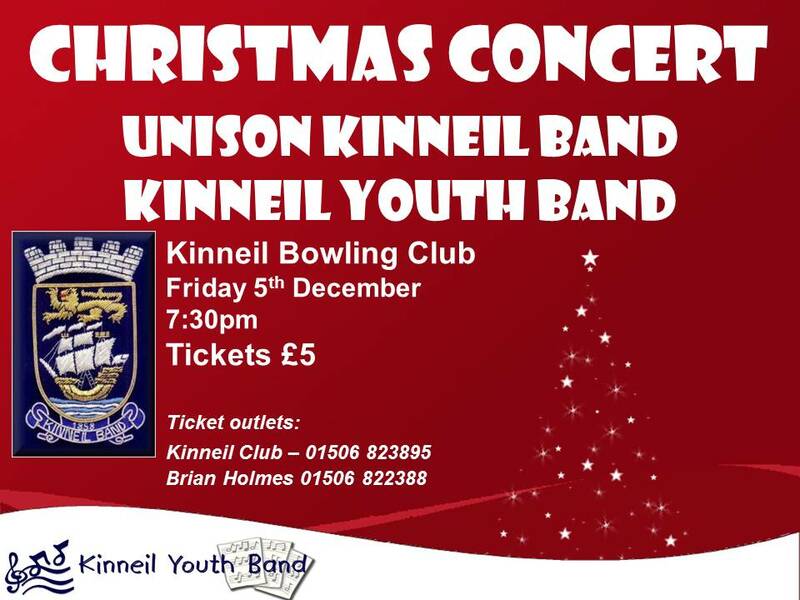 The concert will also feature the thriving Kinneil Youth Band who will be making their fifth appearance at the event. This jam-packed evening of music making promises something for everyone of any age! Phillip McCann is one of the best known names in the Brass Band world. He was Principal cornet with the National Youth Brass Band of Great Britain for five years and his long tenure of the same chair at Black Dyke was during the band’s world-beating period. His acclaimed series of Chandos CDs – The World’s Most Beautiful Melodies – is universally admired; the recordings are featured regularly on BBC Radio, Television and on Classic FM. Phillip’s unique style and tone quality has been used by composers with orchestra for film and TV soundtracks such as Anna of the Five Towns, Woman of Substance and the immensely popular Hetty Wainthropp Investigates – the latter receiving an Ivor Novello Award in the category of Best Music commissioned for a Broadcast Production. UNISON Kinneil Band have had an incredibly successful two years under the baton of Musical Director Craig Anderson having secured one Scottish Championship, one Fife Charities Championship, a top ten finish at the National Finals with the band this year securing a podium place at the Scottish Championships and a top ten placing at the Spring Festival Competition in Blackpool. Tickets priced at only £8 are now on sale from Lyons Hardware – South Street Bo’ness or by calling Brian Holmes on 01506 822388. UNISON Kinneil Band will be in concert at Bo’ness Old Kirk on Thursday 27 February 2014 at 7.30pm. Tickets priced £5 are available at the door. This is a fundraising concert for the Bo’ness Old Kirk so please come along and support this venture. Light refreshments will be available on the night. The Kinneil Youth Band will be hosting a ‘Brass in the Kirk’ evening at Abbotsgrange Parish Church in Grangemouth on Saturday 15th February 2014 starting at 7pm. The youth band has struck up a great relationship with the members of the Abbotsgrange Church who have invited the youngsters back to perform once again in 2014. The event was very popular last year and the band will be performing a number of hymns and songs along with the church choir. If you are looking for some light entertainment why don’t you come along on the night? Tickets priced at only £4 are on sale now from any band member or at the door on the evening. Come along and enjoy a “Night at the Movies” with UNISON Kinneil Band on Friday 23 August 2013 at 7.30pm in Fisons Social Club. The band will be playing many of your favourite film themes and just like the cinema there will be refreshments and snacks available! Tickets priced £5 are available by contacting Brian Holmes on 01506 822388, Ruth Kelly on 01506 828721 or from any band member. This is a fundraiser for our forthcoming trip to the National Finals so please come along and support the band. UNISON Kinneil Band will hold its Annual Concert on Friday 26th April in Bo’ness Town Hall with the night starting at 7:30pm. The band has had a tremendously successful end to 2012 by winning the Fife Charities Competition and then continued the winning streak last month by picking up the Scottish Second Section Championship title. The success has coincided with the appointment of new Musical Director Craig Anderson who took over conducting duties in September last year. 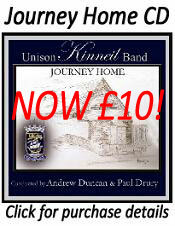 The theme developed by Craig for this year’s Kinneil Band annual extravaganza is titled ‘The Journey of a Century’. We will be taking the audience on a musical voyage featuring pieces dating from the early 19th century all the way to up the current day. Also featuring on the evening will be the immensely successful Kinneil Youth Band, who will perform a series of pieces on the evening. The youngsters always delight the audience with their musical performances and we are sure you will be amazed with the standard of talent on display. Tickets costing £8 (£6 concessions) are available from any band member or by calling Brian Holmes on 01506 822388. We advise you purchase your tickets as early as possible as demand is expected to be extremely high. 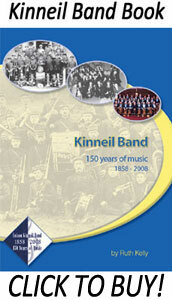 Kinneil Band are holding an informal concert in Bo’ness Old Kirk on Thursday 28th February 2013 from 7.30 to 8.30pm. This will be an opportunity for the band to play out the test piece ‘The Plantagenets’ in preparation for the forthcoming Scottish Championships and may also hear some other favourite numbers from the band too! Entry is free so why don’t you come along and support us in this wonderful setting! 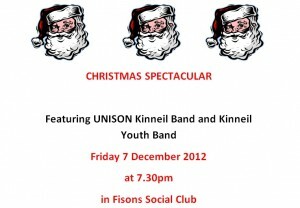 Unison Kinneil Band and Kinneil Youth Band performed their Annual Christmas Concert at Fison’s Social Club this year on Friday 7th December to a very appreciative sell-out audience. This was the band’s first appearance in the new extension at Fison’s and they wowed the packed audience with a number of traditional and modern Christmas numbers mixed with some entertaining classics.Particular highlights of the evening was the Youth Bands rousing rendition of Loch Lomond and a very special Twelve Days of Christmas that involved participation from the all of the audience and a brilliant leaping technique from Music Director Craig Anderson. All of Kinneil Band both Young and Old sincerely appreciate the support that we receive from our community. The band will be out carolling between 10am and 4pm in Morrisons Falkirk on Saturday 15th and Sunday 16th December and will be in Bo’ness Tesco during the same time on Saturday 22nd December. To bring in the New Year Kinneil Band will be making our annual visit to Kinneil Bowling Club at around 2pm on the 2nd January then moving onto Fison’s Social Club at 4pm. Please feel free to bring in the New Year with a few drinks and some familiar tunes. 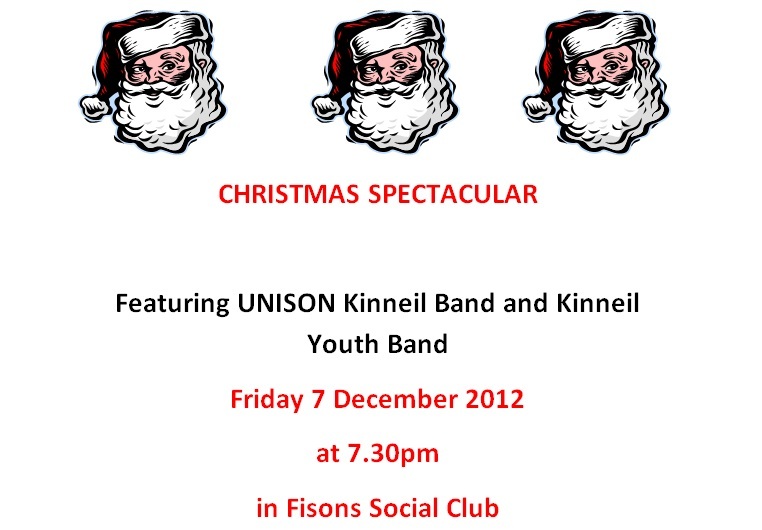 UNISON Kinneil Band are holding their Christmas Spectacular Concert in the Fison’s Social Club on Friday 7th December 2012. The festive evening of entertainment will begin at 7:30pm and will feature our award winning Youth Band. Tickets priced at £5 are ON SALE NOW – we advise you to get your tickets as soon as possible as these are selling fast! Contact Brian Holmes (01506 822388) or Ruth Kelly (01506 828721) to secure your ticket! Kinneil Youth Band is sharing the stage with the Choir of Abbotsgrange Parish Church to bring a very special evening of ‘Brass in the Kirk’. On Friday 28th September the Youth Band will travel to Grangemouth to feature in what is promising to be a wonderfully entertaining musical evening. The night begins at 7:30pm in the Abbotsgrange Church, Abbots Road, Grangemouth. Tickets costing only £5 are currently on sale. Please contact Scott Gardner by email (scottwilliamgardner@gmail.com) or mobile (07584 048594) to secure your ticket. A small number of tickets will be available to purchase at the door on the evening of the concert. UNISON Kinneil Band will hold its Annual Concert on Friday 13th April in Bo’ness Town Hall at 7:30pm. Our very special guest for the evening will be the world famous cornet soloist Phillip McCann. Phillip McCann is renowned all over the world for his unique style and tone quality and his acclaimed series of CD’s on the Chandos label – The World’s Most Beautiful Melodies – is universally admired; they are featured regularly on BBC Radio, Television and Classic FM. His mastery of the cornet has attracted composers with orchestrations for film and TV soundtracks such as “Anna of the Five Towns”, “Woman of Substance” and “Hetty Wainthropp Investigates” – the latter receiving an Ivor Novello Award for Best Music Commission. Bo’ness born and bred, Phillip first learned to play in Kinneil Band before heading south to occupy the principal cornet position in famous bands such as Fairy Aviation and Black Dyke Mills– it is great to welcome Phillip back home to perform at our Annual Concert this year. UNISON Kinneil Band is also delighted to feature its immensely successful Kinneil Youth Band, who will perform a series of pieces on the evening. The Youth Band has continued to grow over the year – gaining a Gold Award at their first ever competition and a Silver Award at the Scottish Youth Brass Band Championships. The youngsters always delight the audience with their musical performances. Tickets costing £8 (£6 concessions) are available from Lyons Hardware (South Street, Bo’ness), from any band member or by calling Brian Holmes on 01506 822388. We advise you purchase your tickets as early as possible as demand is expected to be extremely high.